VML thanks its sponsors and exhibitors whose financial support contribute to the successful outcome of each year’s event. 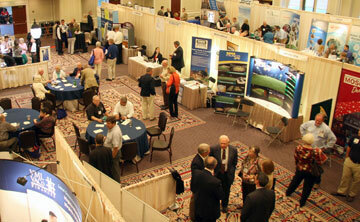 Each fall about 1,000 local government officials, speakers and exhibitors attend the VML Annual Conference. The annual conference provides Virginia’s local government officials with the chance to shop for the latest equipment, technologies, and services for their municipalities. Be sure to visit the exhibit hall to see the latest in products and services for local governments. Exhibit booth includes 2 exhibitor registrations, additional representatives are $325 per person. Note: Exhibitor registrations include admittance to all conference events, functions and meals (excluding ticketed meals).